Amidst the current shaky economic and financial status, building and construction sector in Bahrain witnessed launching a full-raft of large scale projects. This comes as a part of Bahrain Government’s strategy to diversify its sources of income and reduce its dependence on oil revenues. Rolling out projects of such proportions reflects the government’s intention to carry on the same track of economic development despite the unfavorable conditions. The launched projects vary in type between hydrocarbon industries, infrastructure, properties and hotels, and manufacturing. Here’s a list showcasing some of the most significant projects. Described as a new embodiment of the fraternal relations between Kingdom of Saudi Arabia and Bahrain Kingdom. The project’s construction value is estimated to hit $7.2 billion, and it’s expected to be completed by 2025. 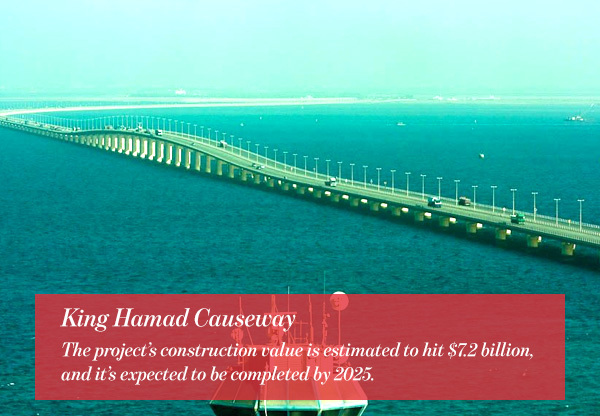 Stretching over 25 kms between Dammam and Bahrain’s Budaiya, the bridge is regarded as an integral part Gulf Transportation Program which will bind all GCC states together. 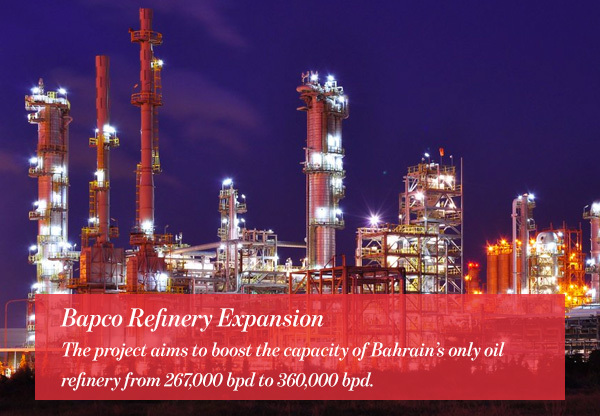 Construction is underway on developing Bapco’s refinery located in Sitra. The project aims to boost the capacity of Bahrain’s only oil refinery from 267,000 bpd to 360,000 bpd. It’s worth mentioning that Bapco is fully owned by Bahrain government and it works in oil extraction, refinement, and distribution. 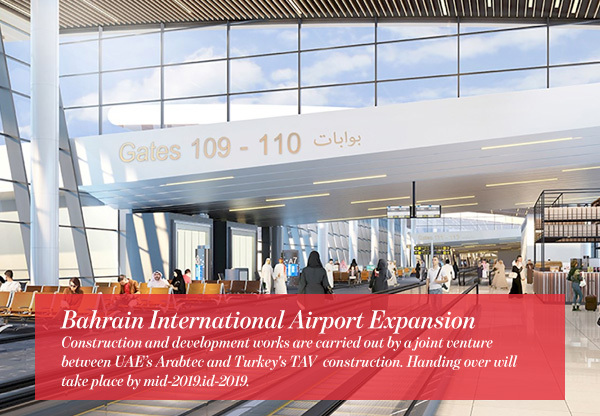 For sake of increasing its annual capacity to 1.4 million passengers, Bahrain has launched a $1.1 billion expansion project on its only international airport. Construction and development works are carried out by a joint venture between UAE’s Arabtec and Turkey’s TAV Construction. Handing over will take place by mid-2019. The project includes establishing a new terminal, services building, and a new aircraft apron. 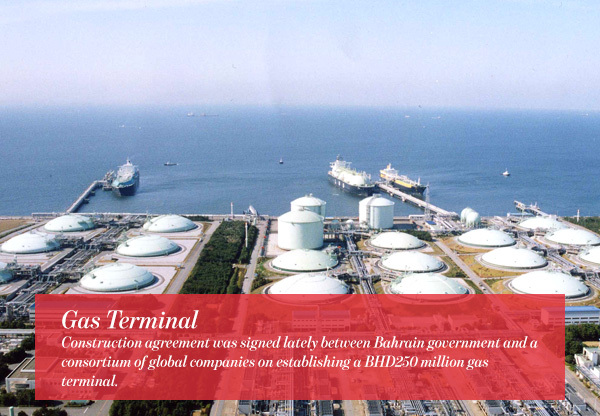 Construction agreement was signed lately between Bahrain government and a consortium of global companies on establishing a BHD250 million gas terminal. The project comprises a floating storage unit, an offshore gas receiving facility, a subsea gas pipelines, and an onshore gas receiving platform. The terminal’s initial capacity will be 400 million cubic feet per day. Last November, Al Tijaria Real Estate Development has uncovered its new property gem in Bahrain International Properties Exhibition (Bipex). A 50-floor residential tower in the heart of Seef district which will carry the company name. 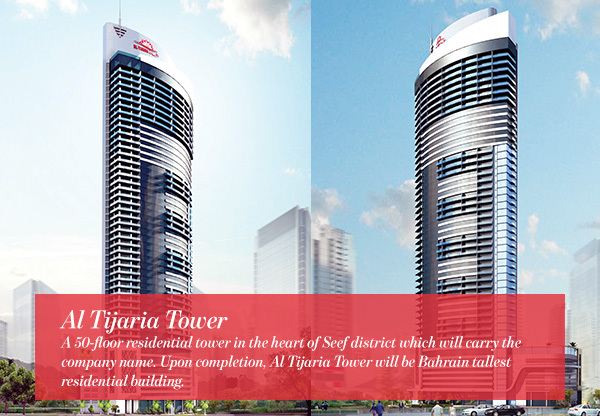 Upon completion, Al Tijaria Tower will be Bahrain tallest residential building. 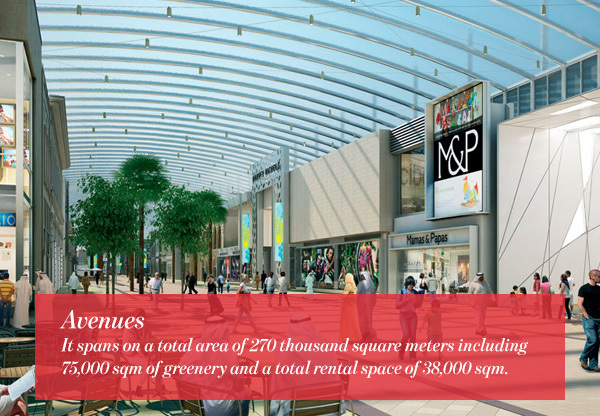 The project stands in a strategic location only a few minutes from Bahrain International Airport, King Fahd Causeway, and Bahrain’s top commercial centers like Seef Mall and City Center. Moreover, the tower lies in a close proximate to a number of cultural landmarks like Bahrain National Museum. A new commercial and entertainment venture to ensure Bahrain’s place as an ultimate touristic destination in GCC. The project includes retail spaces, restaurants, cafes, cinema halls, running tracks, gym, children’s play area, and parking lots. It spans on a total area of 270 thousand square meters including 75,000 sqm of greenery and a total rental space of 38,000 sqm. The project stands on only one floor. The renovation of Muharraq’s waterfront or “Saada” project is meant to take advantage of the area’s high potential as one of Bahrain’s most significant heritage sites. 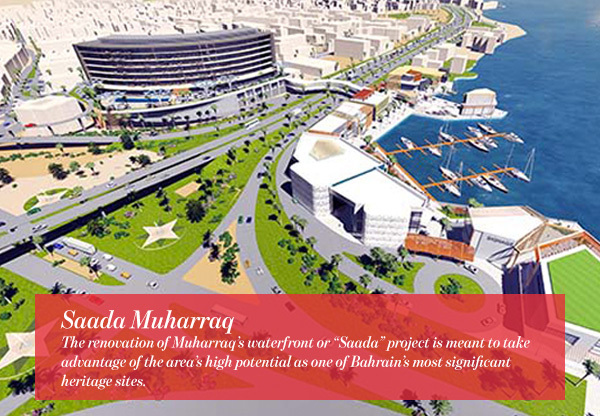 As a part of the construction, Muharraq Souq will be revamped and linked to the new waterfront via a walking bridge. The BHD45 million project includes also a number of communal, commercial, and recreational facilities such as multi-storey parking lot and restaurants area. 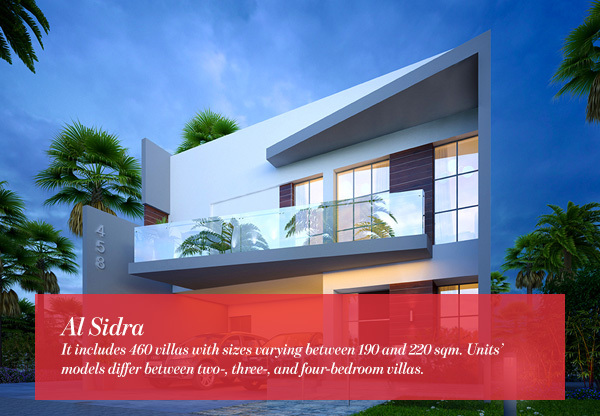 Al Sidra is a unique residential community catering an exceptional living experience to clients. It includes 460 villas with sizes varying between 190 and 220 sqm. Units’ models differ between two-, three-, and four-bedroom villas. Al Sidra lies in the vicinity of Marassi Al Bahrain project, it comprises significant touristic and recreational facilities including a mall and a hotel. 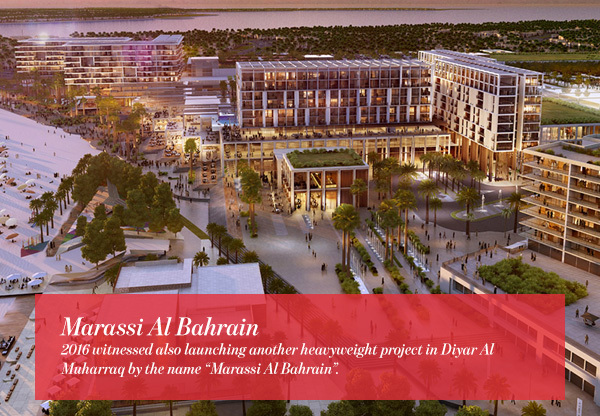 2016 witnessed also launching another heavyweight project in Diyar Al Muharraq by the name “Marassi Al Bahrain”. With an investment value of 1BHD billion, the project is carried out by a joint venture between Abu Dhabi-based Eagle Hills and Diyar Al Muharraq Company. The first phase sprawls over a 300 m waterfront, it includes 500 residential units along with a number of hospitality and recreational venues. Marassi Al Bahrain is poised to officially start by the third quarter of 2018.